For the sauce: At medium temperature, melt the butter and add the flour to it. Stir for 1-3 minutes and slowly pour the milk. Continue to stir for another 5-8 min. until you remove the clumps. For the rolls: Prepare 24 muffin shapes and sprinkle the bottoms with a little cheese. Dip the lasagna in water to soften it, and then cut each sheet in half through the length and in half through the width. On each slice, put Bolognese/marinara sauce, bessamel and a little parmesan and put it in the muffin shapes. 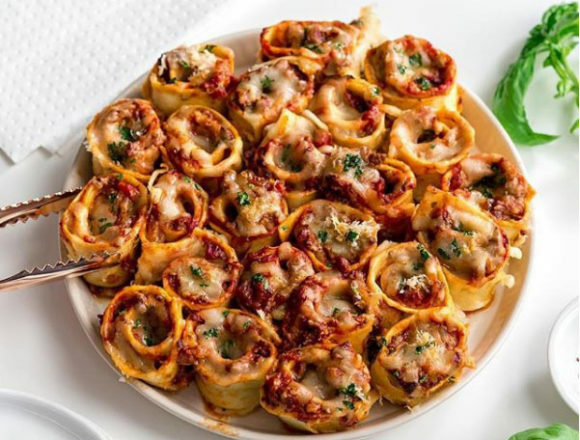 Sprinkle all the rolls with mozzarella and the remaining parmesan and bake them in the oven at 190 degrees for 30 minutes. You can decorate with a little basil before serving.